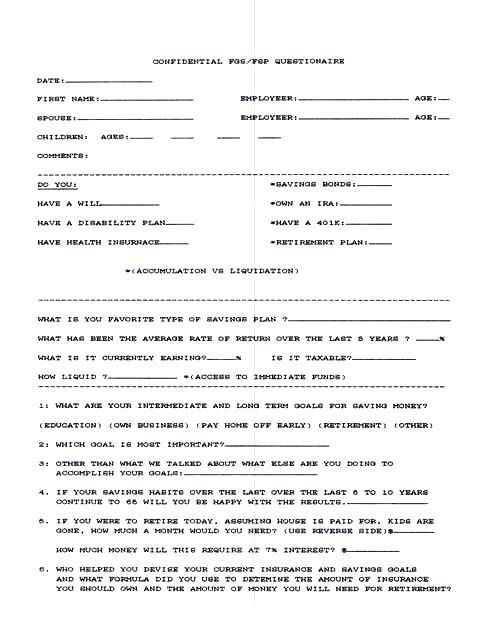 Confidential Questionaire. Qualify your prospects upfront. This selling concept can produce unlimited positive results. Out of all the topics written in this website, this topic page, in my opinion, is the most important article you need to read and comprehend. It explains how to use a dynamic pre-interview questionnaire I developed with my agents and refined throughout my selling years. But before I do that, let me set the stage. The objective of this Confidential Questionaire is to ask key questions before you get into your presentation and to listen to the prospect. It helps to define you and your prospects intentions. I never expected a new agent to have this mastered in their first 10 or 12 interviews. It is something you will learn to master with practice and more practice. This fact finding session is where your sale is made or lost and is pertinent to the end result. Believe it or not, I actually closed on the sale using this questionnaire, even before I went through my presentation, by getting a money commitment from the prospect. As I explained in the sales process, when dealing with people. “People buy what they want and not what they need.” Find out what they want and develop your sales presentation around that theme. Learn to sell people on concepts and ideas not products or insurance policies. What is it that this Insurance policy is going to do for me and my family? Let me explain. The Automobile Industry sells its cars and trucks around concept selling. (Eg: “This car will make you feel better. It makes you enjoy life more, and so on” verses it has a 500 hp engine and six spark plugs and a backup battery.) not the product. Many companies provide a fact finding worksheet with all kind of personal data that you ask the prospect for, which is important. However they do not ask, what I consider the key questions that will help you actually make the sale and remove many of the objections at closing. By refining this fact finding questionnaire and asking questions upfront, I found out that I could minimize objections at closing and eliminate a number of other objections during the interview process. As an example, early on in my career, I would run into the following objection at closing, "Well I have to talk to my Father, my Mom, my Accountant, whoever?" This was a way for the prospect to delay a decision. So to eliminate that objection at closing I decided to include that question up front in my questionnaire. If they did have to visit with someone then I would say, when can we schedule an appointment with your Dad, Mom, CPA or whoever? This is where you interrogate your prospect, as I call it. It is where you start to set the stage. As I have mentioned in some other topic pages, this is the area where most new agents fall flat on their face. You need to run the interview in an effective manner. You need to Learn to listen and ask the right questions. See Insurance Selling Tips.Most agents talk to much. They think they need to do all the talking to impress the prospect. One of the key ingredients in relationship building is let the other person start talking about themselves. Think about it for a second. Aren't you impressed with people who let you talk about yourself? 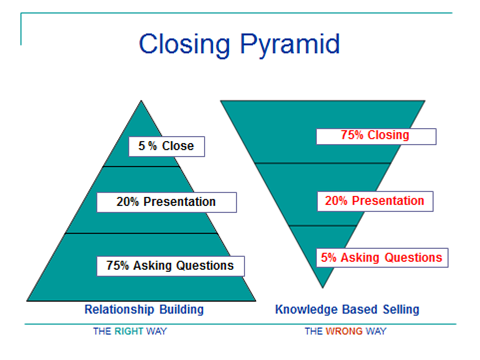 Sales Tip: It is so important to ask the right questions and then shut up and listen. If you can get people to start talking about themselves and what they want and what their concerns are, it will help you set the theme for your presentation. When I say theme, this is the prospects hot button that you can then refer to through out the interview. People do not like to be sold anything, they like to buy things. As an example, let’s say you find out what their hot button is. Let’s say it is to make sure that his son or daughter gets a good education, or he wants to retire at 57, or he wants his wife to stay home and take of the kids while they are growing up. You will then spend a lot of wasted time during the close throwing out all kind of different reasons in hopes that they will buy your product. In most cases you will walk out of the house without a sale. Why? Because you did not listen to what the prospect wanted and did not ask the right questions. Learn to listen. The information below shows you what we included in our questionnaire. However, if you want to build your own Confidential Questionaire, you can add or subtract any information you feel necessary. Here is a look at page one. If you can not get the prospect to agree to some type of dollar amount, for what ever reason, then there is no reason to even start the interview process. If a prospect told me they are not in a position to set any money aside for their financial future or family protection, I start to close my computer up or sales book and say “Mr. Prospect, since you are not in a position to do anything now, when would be a good time to get back to you? Don't waste your time if the prospect disqualifies themselves.